For people that need to use Node.js in an enterprise environment, NodeSource has developed N|Solid. 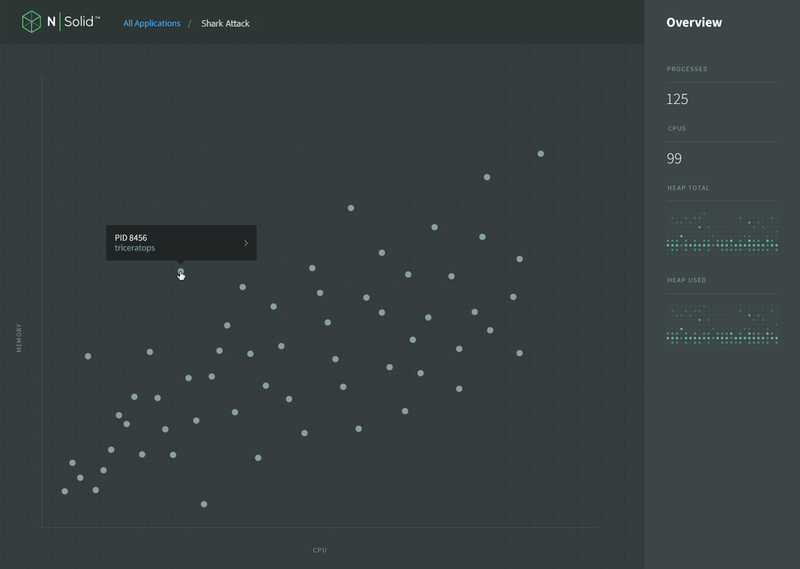 Backed by NodeSource's 24x7 support, N|Solid adds enterprise-grade diagnostic and security features delivered on a release cycle that is aligned with Node.js Long Term Support (LTS) releases. This provides a stable, production platform for all of your Node applications. N|Solid benefits from the experience and insights of several core contributors to the Node.js ecosystem. Rather than trying to adapt existing tools that assume a synchronous program flow, we chose to build native tools for Node.js that provide live instrumentation of your production system's health and stability, including CPU profiling and heap snapshot analysis, with no changes to your application code. N|Solid is a diagnostic tool that is designed to enhance Node.js to meet the needs of enterprise applications deployed in production. At times, Node.js can feel like a black box, especially as the shift to an asynchronous programming model changes how we interpret the data we do have and how we reason about it. Furthermore, the ability to control access and define policies for application is critical in enterprise environments. N|Solid includes a powerful security policy model that allows restricting access to system resources by untrusted modules. A more secure memory allocation model is included to prevent unintended data exposure. Complementing the tools provided by the N|Solid Agent, we also provide the N|Solid Hub and the N|Solid Console. The N|Solid Hub provides a centralized service registry and proxy for all of your Node.js applications using N|Solid. It is designed to work with modern deployment models where services start or stop via auto-scaling or are simply containers of microservices in a cloud infrastructure. The N|Solid Console provides centralized access to all of your applications and an aggregated view of each application's processes. This holistic view simplifies triage at runtime, makes it easier to look for outliers, and take advantage of advanced diagnostic tools directly from your browser. The combination of the N|Solid Runtime, Hub and Console make N|Solid an invaluable tool for gaining insight into the behavior of your production applications at runtime. N|Solid 1.0 is delivered bundled with a Node.js 4.x runtime. All N|Solid features are additive, meaning any application that runs on Node.js 4.x will also work with N|Solid 1.0. To verify what version of Node.js that you have bundling N|Solid, use node -v.
For more information about the Node.js API, consult the Node.js API Documentation. Extract to your preferred location. Add the contents in the extracted bin folder to your $PATH or a location on your $PATH, such as /usr/local/bin. If you have another installation of node or npm on your system, the N|Solid bin location must be before it in your path. This will make binaries available for nsolid, nsolid-cli, npm, and node (which is a link to nsolid). We also provide a native installer for OS X.
Verify that the nsolid version number is as expected. The N|Solid Hub facilitates communication with all of the processes in an application that is run under N|Solid. It is comprised of two components; the Service Registry and the Proxy. 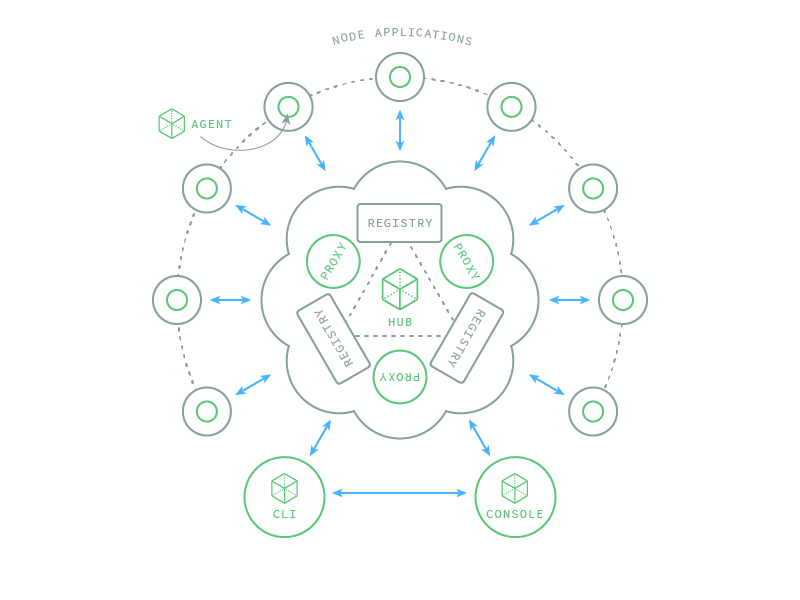 The Service Registry is the component which N|Solid Agents register themselves to, in order to facilitate communication with N|Solid Hub clients. The Proxy is the component that allows remote communication to be forwarded or broadcast to your N|Solid Agents via the N|Solid Console or N|Solid CLI. If not installed, download the latest stable version of etcd (2.x.x family) for your platform here: https://github.com/coreos/etcd/releases and follow instructions for installation. The N|Solid Proxy is a Universal binary for Linux and OS X. For a more permanent installation, install the N|Solid Proxy as you would any normal Node.js production application in your infrastructure. If you are using Finder to introspect the downloaded file and to copy the files to their final destination, be sure to copy the directory rather than the individual files in the directory. As Finder doesn't inherently show . files the .nsolid-proxyrc file will not be copied. If this file is not present, you will receive a throw new Error("Could not find configuration for port")Error: Could not find configuration for port message upon start." You can verify that the N|Solid Hub is installed correctly by following the instructions below. Next we need to run the proxy in order to allow our tools to query the registered instances of N|Solid. The start command will run the proxy.js file as defined in the package.json file. The default configuration for the N|Solid Hub is for the N|Solid Proxy to listen on port 9000 on all interfaces. This can be configured by updating the provided .nsolid-proxyrc configuration file. Now, we can run an instance of N|Solid that we will query. You may replace server.js below with the filename for your Node.js application. If you are using the hub you can set the NSOLID_SOCKET=0 as N|SOLID will pick a port number itself. Finally we can run the query in order to see information about our instances of N|Solid. The N|Solid Console is a Web application that provides a consolidated view of all N|Solid applications that are registered with the N|Solid Hub. The N|Solid Console is best experienced using an evergreen browser (Chrome 21+, Firefox 22+, Safari 6.1+, Microsoft Edge) on a desktop/laptop system. The N|Solid Console uses a collection daemon that should be able to connect to the N|Solid Hub. This can be quickly tested by running a command on the host. Note the console uses WebSockets to fetch metrics from the collection daemon that may affect the system / network configuration. If the console is able to load, but no metrics are coming through, check the browser’s network inspector to ensure WebSocket connections are being negotiated successfully. If they are, but there are still no applications displayed in the console, please confirm the N|Solid instances are running and have been properly registered with the N|Solid Hub. For people who need to use N|Solid in a Dockerized environment, NodeSource has developed the N|Solid Docker images. These images are built with the enterprise customer in mind, developing a versatile set of independently scalable Docker images that work together to provide a unified N|Solid experience across all of your Dockerized infrastructure. In addition to being friendly to enterprise operations teams, the N|Solid Docker Images have been designed to be accessible to developers. For those who are already using Docker, these images provide an easy way to get up and running with the N|Solid console. With the use of docker-compose, you can now get the full N|Solid Console on your local machine with a single command: docker-compose up. We provide 5 separate Docker Images for N|Solid, allowing each component of the platform to be scaled and deployed independently. the base image that your Docker images should build from. It provides the N|Solid runtime and agent. 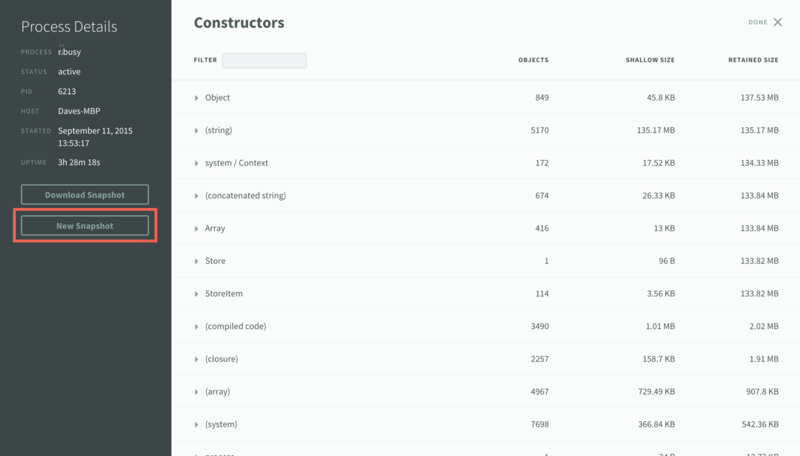 provides an easy way to query statistics from your Node.js processes. It is meant to be run directly from the command line. contains the N|Solid Hub service registry. Your Node.js applications will need to be able to talk to this. 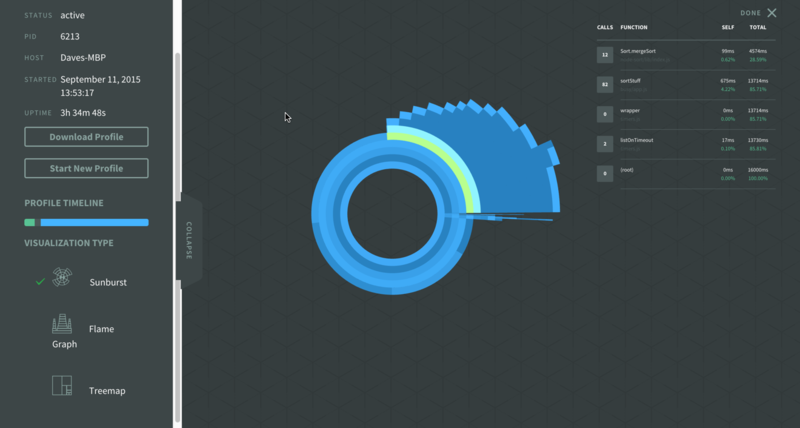 contains the N|Solid console, a web based interface for monitoring your Node.js applications. You will need to bind the internal port 3000 to your host. This container will need to be able to talk to the hub container. All of the images are built on the official ubuntu:trustyimage maintained by the Docker project. By default, this will bring up the N|Solid Console running on 127.0.0.1:3000, and the console will be monitoring itself. This will bring up the N|Solid console available on localhost:3000 and monitoring itself by default. First, ensure your application is compatible with the LTS release of Node.js. NodeSource has created upgrade-ready to assist with this. If you are new to Docker, follow the steps in our blog post to get your application into a Docker container. For the complete documentation on defining a service with docker-compose.yml, refer to the Docker project’s documentation page: https://docs.docker.com/compose/overview/. docker build -t example . Congratulations, you are now up and running with N|Solid and Docker! Using Docker with N|Solid introduces some networking edge cases that can make multihost deploys challenging. These images have been developed specifically to address this. When used correctly, these images should seamlessly worked together across multiple hosts. By default, Docker will create an isolated network on the host that the container binds to. Then, Docker configures a mapping from the port’s on the containers network to a port on the host’s network per the configuration you pass at runtime. This introduces the case where, by default, the IP address that the N|Solid agent sees from inside the container is not the same IP address that the N|Solid hub needs to communicate with the agent. There are a few methods to address this in Docker, and they all boil down to making sure the IP address that the hub needs, and the IP address that the agent sees, are the same. If you are using containers to isolate resources and not to run untrusted code, it is safe to use docker run --net=host to allow the container to bind directly to the host’s ports. This is the most direct way of getting the hub to talk to the Dockerized N|Solid agent. This allows the container to bind directly to the host’s ports, including low-numbered​ ports. If you are running untrusted code, this is a security risk and should be avoided. Note: In addition to Virtualbox, docker-machine supports drivers for various cloud providers. View the full list of cloud providers and how to use them with docker-machine here. $ eval "$(docker-machine env nsolidkv)"
$ eval "$(docker-machine env -u nsolidkv)"
We will now create one or more slave nodes for our swarm cluster. Re-run the following command as many times as you like (incrementing the node id) to generate slaves. Finally, create an overlay network on the swarm. $ eval "$(docker-machine env --swarm nsolid-master)"
At this point, any container you deploy to the swarm will support DNS resolution by container name, and the IP address that the N|Solid agent sees will be the same IP address the hub container needs. The Command Line Interface (CLI) can be used in conjunction with a configuration file (nsolid-clirc) to pre-set values such as the hub location and a default app name. The file .nsolid-clirc should be placed where nsolid-cli is installed or in your home directory. Once this is set, running the CLI ls command will return values associated with the default app. N|Solid, the N|Solid Proxy and N|Solid CLI all can have debug messaging enabled by using the NODE_DEBUG=nsolid environment variable. The N|Solid Console and CLI use the N|Solid Hub to query for metrics. The host and port that the Hub is configured to listen on must be accessible to these clients. Similarly, when the N|Solid Hub communicates with an N|Solid instance, the host and port for the instance must be accessible. Without this route, there will be no way to query specific data about the instance. This is a bi-directional route as the N|Solid instance actively communicates back to the Hub. The N|Solid Proxy (a part of the N|Solid Hub) is the component that allows remote communication to be forwarded or broadcast to your processes via the N|Solid Console or N|Solid CLI. The N|Solid Proxy is configured via an rc file, with a default provided configuration file .nsolid-proxyrc. Broadcast queries are the default operation of the CLI. You can use nsolid-cli --id in order to change to a non-broadcast query. Any operation except for ls needs to be approved for broadcast. This is to prevent extraneous traffic and accidental load from performing large operations. In your .nsolid-proxyrc add the names of any commands you wish to be available for broadcast queries. If you create custom commands that you wish to be able to broadcast query you will need to add them to the broadcast list in your .nsolid-proxyrc file. NSOLID_APPNAME - This is the name of the application that the N|Solid instance is running. Use this in order to create logical groupings of the processes in the N|Solid Console. If omitted, the value defaults to nsolid-default. NSOLID_SOCKET - This is the address that your instance's N|Solid Agent will be listening on for queries. It accepts an address or hostname bound by an interface on this machine and an optional specified port. If no port is specified, or port 0 is specified (e.g. NSOLID_SOCKET=localhost:0) the N|Solid Agent will request an open port from the operating system's ephemeral port range. We suggest allowing the N|Solid Agent to select the port number. This provides greater compatibility with modules such as cluster and will be automatically discovered correctly when using the N|Solid Hub. The rate at which the N|Solid Console sends queries can be adjusted when you start the console via the --interval which accepts a number of milliseconds to wait between polling for new information. Be aware that changing the interval to lower amounts may cause excessive network traffic. By default this value is set to 5 seconds. Setting this to larger values will result in lower traffic but delays of information given to the management console. N|Solid ships with the ability to enable some security-related policies to help harden your application. Currently these include the ability to automatically zerofill Buffers upon allocation and disabling core modules. To enable policy configuration with N|Solid, you must create a policies JSON file and specify that file using the policies flag when starting the N|Solid runtime. For more information on Policies read here. The default configuration when running N|Solid is to behave exactly like Node.js. 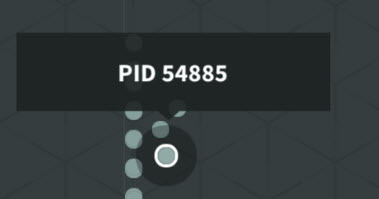 The agent is disabled and the default policy set is the default Node.js behavior. The N|Solid Agent is a small service running inside each N|Solid process. It provides a control point and access mechanism for all of the instrumentation included in N|Solid. All of the instrumentation included in N|Solid is controlled via the Agent. Each of these are exposed as a command that can be called via the Agent's listening socket by the N|Solid CLI or N|Solid Console. Internally it exposes an API that can be used to expose additional custom behavior that can be served by the Agent. To enable the N|Solid Agent, you must either specify a value for NSOLID_HUB and/or NSOLID_SOCKET in your environment for each process that runs under N|Solid. Running in Standalone mode is typically for installations without N|Solid Hub, such as in a development environment. To run in Standalone mode, one simply needs to specify the NSOLID_SOCKET address for the N|Solid Agent to listen on. An N|Solid process running in Standalone mode can be contacted directly via the N|Solid CLI. Read more about the N|Solid Agent Commands here. For most non-development environments, the N|Solid Hub is designed to provide a mechanism for auto-configuration and discovery of N|Solid processes. The N|Solid Agent Configuration section contains information about configuring the Agent to register with the Hub. The N|Solid CLI provides a simple command-line interface communication to your N|Solid processes, either directly or via the N|Solid Hub. The N|Solid CLI is bundled with N|Solid and available in your path if N|Solid is installed as described. All Agent commands are supported as CLI commands. Additionally, the Proxy exposes a ls command which will list N|Solid processes as registered in the N|Solid Hub. Error trying to connect to N|Solid: Error: "Command 'profile_start' is not broadcast approved, id is required." Any command will be considered a broadcast if it does not have the app and id specified, independent of the number of processes that will be queried. N|Solid ships with the ability to enable some security-related policies to help harden your application. Currently these include the ability to automatically zero-fill buffers upon allocation and disabling core modules and bindings. To enable policy configuration with N|Solid, you must create a policies file in JSON format, and specify that file via the policies flag when starting N|Solid. The default Node.js memory allocator reuses memory without clearing it. In the case of bugs or malicious code, this can result in the application transmitting data that happened to be in memory that shouldn't be transmitted. This can be used as a basis for exploit, or may result in program data not being consistently initialized. By default,** Node.js does not zero-fill memory for performance reasons**. This leaves data safety up to the application developer, however, this burden also exists for all third-party dependencies that you use. You can configure N|Solid to zero-fill allocated memory to prevent these issues. There is a slight performance degradation for enabling this feature. N|Solid includes the ability to disable core modules with a policy file. This can be used to restrict application access to system resources or features that should not be used by your application. bindings are the wrappers for native code, e.g. stream_wrap or tcp_wrap. 0 ignore No notice will be provided during the loading of the module or binding.\n\nThis is the default behavior. 1 warning A warning is written to stderr during the loading of the module or binding. The application otherwise runs normally. 2 throw error A error is thrown only when the policy is violated​ which doesn't occur during the ​loading​ of the module, but when a function on it is called. You can catch this by writing a try/catch in your code around your require() calls. 3 exit The application exits during the loading of the module or binding. Access to bindings can also be restricted, if so desired, by the policy writer. The example policy file above disables both the dns module and the cares_wrap module, both of which can be used to access DNS. When a non-core module attempts to access a disabled core module, messages will be logged to stdout, and an exception thrown. nsolid error But it was disabled in the policies. Error: Binding "cares_wrap" has been disabled by the policies flag, using "GetAddrInfoReqWrap" on it is not allowed, terminating execution. Error: "child_process" has been disabled by the policies flag, terminating execution. We can still access it!! Now the behavior is blocked! nsolid error But it was disabled in the policies! Error: Binding "cares_wrap" is black listed, but no replacement was found. We allow properties whose keys start with"//" anywhere and they are ignored. Anytime an unexpected property or a property with an invalid value is encountered, the policies are considered invalid and the process halted. N|Solid's policies feature should not be used as a blind replacement for good security practices with regard to your code and the code of your application's dependencies. 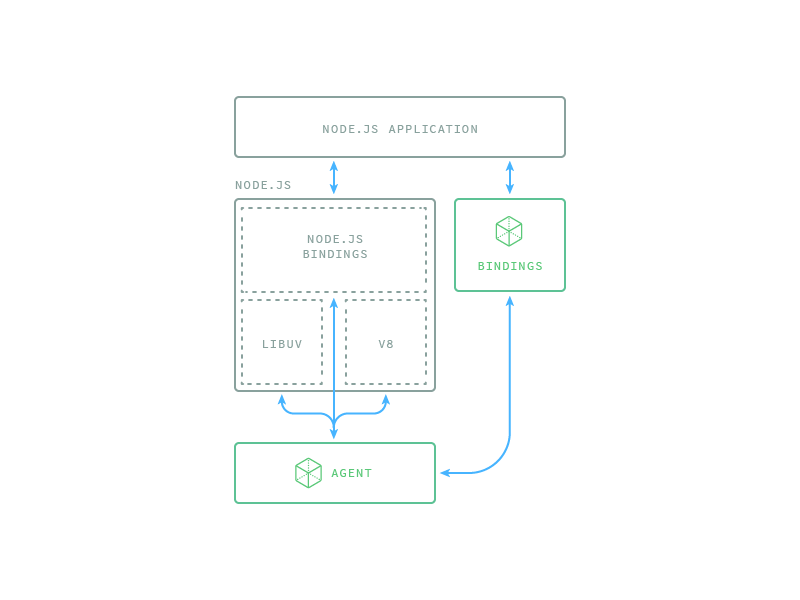 Disabling core modules and bindings does not provide a complete guarantee that your application is unable to use the features provided by those parts of Node.js. For example, child processes interacting with Unix utilities, if not disabled, can be used to replace the functionality of many of the core modules. Some core modules may be completely re-implemented in user-land modules, such as the dns and cares_wrap functionality. Compiled add-ons have complete freedom to insert new functionality that can replace anything that has been disabled.\n\nN|Solid's policies features augment and support existing enterprise-wide application security hardening programs. Please contact NodeSource if you wish to discuss your Node.js application security needs and prepare a customized security hardening program that involves the use of internal and third-party code review, application monitoring and the use of operating system security tools. The following is a list of modules that can be blacklisted. It should be noted that for most of these modules it is rare to have a business need where blacklisting makes sense. debugagent Provides support for debugging node.js, mostly used internally. _debugger Provides support for debugging node.js, mostly used internally. _linklist Data structure used internally by node.js. assert Used for writing unit tests for your applications, you can access it with require('assert'). buffer Raw data is stored in instances of the Buffer class. child_process Provides a tri-directional popen(3) facility in order to create a child process. console Console object is a special instance of Console whose output is sent to stdout or stderr, - constants. crypto Crypto module offers a way of encapsulating secure credentials to be used as part of a secure HTTPS net or http connection. cluster Allows you to easily create child processes that all share server ports. domain Pending deprecation - provide a way to handle multiple different IO operations as a single group. freelist Data structure used internally by node.js. fs Provides file I/O via simple wrappers around standard POSIX functions. http Provides ability to create http servers and clients. httpagent Provides support for http and https modules, mostly used internally. httpclient Provides support for http and https modules, mostly used internally. httpcommon Provides support for http and https modules, mostly used internally. httpincoming Provides support for http and https modules, mostly used internally. httpoutgoing Provides support for http and https modules, mostly used internally. httpserver Provides support for http and https modules, mostly used internally. https Provides ability to create https servers and clients. module Provides the node.js module system, mostly used internally. net Net module provides asynchronous network wrapper for server and clients. os Provides basic operating-system related utility functions. path Provides utilities for handling and transforming file paths. process Same as the global process object. querystring Provides utilities for dealing with query strings. readline Allows reading of a stream (such as process.stdin) on a line-by-line basis. streamreadable Provides the ReadableStream exposed via the stream module. streamwritable Provides the WritableStream exposed via the stream module. streamduplex Provides the DuplexStream exposed via the stream module. streamtransform Provides the TransformStream exposed via the stream module. streampassthrough Provides the PassThroughStream exposed via the stream module. streamwrap Provides the wrapper to the libuv stream implementation, mostly used internally. string_decoder Decodes a buffer to a string with utf8 support. timers Provides internal support for global Timers. tls Uses OpenSSL to provide Transport Layer Security and/or Secure Socket Layer: encrypted stream communication. tlscommon Provides support for tls module, mostly used internally. tlslegacy Provides support for tls module, mostly used internally. tlswrap Provides support for tls module, mostly used internally. tty Provides the tty.ReadStream and tty.WriteStream classes. url Provides utilities for URL resolution and parsing. util Primarily designed to support the needs of node.js's internal APIs, but many of these utilities are useful for user programs. v8 Events and interfaces specific to the version of v8. vm Provides support to compiled code and run immediately or compile, save it, and run later. zlib Provides bindings to Gzip/Gunzip. profiler Profiler module (explained in nsolid docs). functionorigin Internal module used by nsolid. modulewrap Internal module used by nsolid. modulewrap_known_modules Internal module used by nsolid. modulewrap_known_bindings Internal module used by nsolid. policiesvalidation Internal module used by nsolid. nsolid Internal module used by nsolid. nsolid_versions Internal module used by nsolid. The following is a list of bindings that can be blacklisted. It should be noted that for most of these bindings it is rare to have a business need where blacklisting makes sense. async_wrap Base class for all async request modules which supports hooks into async events. buffer Interface to libuv methods to operate on buffers. cares_wrap Wraps the cares library for asynchronous name resolves. contextify Interface to v8 in order to create execution contexts. fs Interface to file system methods provided by libuv. fs_event_wrap Binding to listen to file related events in order to support watching files and directories for changes. js_stream Binding that provides support for node.js streams. os Interface to libuv in order to obtain process state information. pipe_wrap Wraps libuv's socket implementation. process_wrap Provides process functionality such as spawning child processes. signal_wrap Supports sending and handling signals to processes. spawn_sync Supports child_process.execSync functionality via libuv. stream_wrap Wraps stream implementations exposed by libuv to communicate via file descriptors or network connections. tcp_wrap Integrates TCP functionality exposed by libuv in order to create TCP connections. timer_wrap Integrates with timer functionality provided by libuv so support things like setTimeout and setInterval. tls_wrap Provides TLS termination functionality via crypto. tty_wrap Integrates with TTY terminal functionality provided by libuv. udp_wrap Provides UDP protocol functionality such as binding and broadcasting. uv Provides libuv integration such as error name resolution. v8 Limited interface to the v8 API, i.e. to set flags and get process information. zlib Wraps the zlib library. The N|Solid Console provides valuable insight into clusters of N|Solid processes running in a variety of configurations. Processes are grouped by their associated application which makes it simple to find outliers in memory/CPU utilization and quickly identify unexpected behavior. Navigating to an individual process shows various metrics and provides the capability for taking heap snapshots and CPU profiling. Collected metrics are stored in memory and restarting ncollect will cause these to be lost. Heap snapshots and CPU profiles are stored in the directory specified with the --storage command line argument specified below. Simply copy the directory specified by the --storage command line argument on the source host to the new host. Be sure to specify the new storage directory with --storage on the new host. These are the command line arguments if you're starting the console explicitly. For most usages, you would utilize npm start. --duration= The length of time to retain graph data in minutes. The N|Solid Management Console logs are stored at /var/log/nsolid-console.log or output to the terminal, depending on the system configuration (see Installing the console: Step 5 - Setup ~ns/.nsolid-clirc.....). If errors are encountered while using the console, these logs can be used to help identify/fix the problem when conversing with N|Support. During N|Support correspondence, any error messages in your browser's console should also be included to provide as much context about your problem as possible. Please refer to the Installing N|Solid Console section for troubleshooting. Application Overview The Application Overview grid is a 5x5 matrix where each vertical dot represents 20% of available memory with the top being 100% memory utilization and each horizontal dot representing 20% of available CPU capacity with the far right being 100% of CPU capacity.\n\nThe size of the dot is a function of the number of processes occupying a particular usage slot; for example if five processes were at 22% CPU usage and 15% memory, that dot would be larger than a single process at 22% CPU Usage and 35% memory.\n\nColors are a reflection of what cell the dot is in; colors go from green to red as you move up and right on the grid. Red is naturally the color of severity, so if you have a lot of red dots on your application's grid, that is a call for immediate attention.\n\nIt is important to note that since an application can run on multiple hosts, you have have larger dots in the upper right; if you have 10 machines all running at 100% of CPU and memory, that upper right dot will be larger than a single process dot.\n\nNote that this graph provides aggregate data: if your application executes in more than one process, there is no correlation between the number of enlarged dots and the number of processes running. Application Name Each application gets its name from the NSOLID_APPNAME environment variable (NSOLID_APPNAME=\"SharkAttack\" nsolid myapp.js). \n\nIf NSOLID_APPNAME is not set, your application (along with any other unnamed applications) will appear in this list under nsolid-default. If two or more different processes are run with identical NSOLID_APPNAMEs, data from each process will be aggregated into a single application view entry. Hosts The number of host machines are being traced for this application. 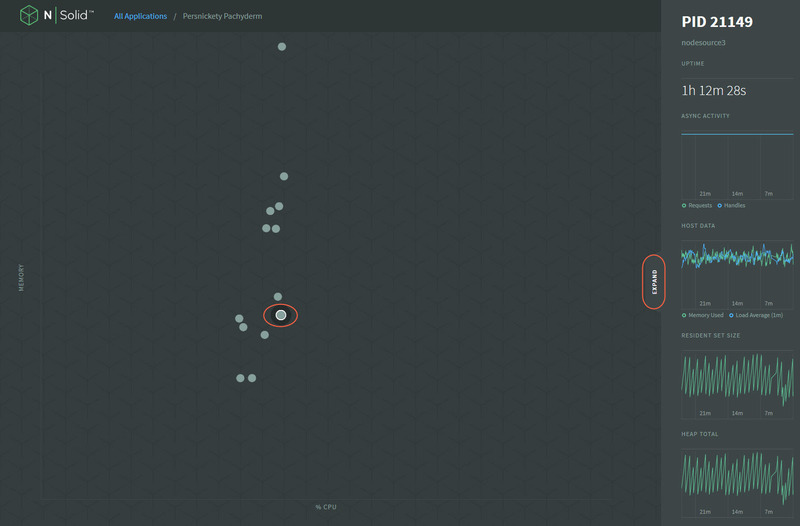 The Cluster view is a force-directed scatter-plot that provides an overview of your application’s performance across all connected processes. The Y axis plots the ratio of that process’ Resident Set Size (RSS) memory usage over the application’s total RSS memory usage. The X axis plots the % CPU utilized for each process. Clicking the “Expand” button on the edge of the sidebar will open the Process Detail View. The Process view shows information relating to a specific process. To select another process, click [Collapse] to close the process view. Then, select the dot in the Cluster view that represents the process of interest. Finally, click [Expand] on the sidebar to return to the process view. Uptime: This is the total time elapsed from the moment when the process was started. Host Data: Host data is a statistic based on the percentage of memory used and the CPU load average over the last minute. For details on the host system running the process, click [🔎 More] underneath the Host Data chart. 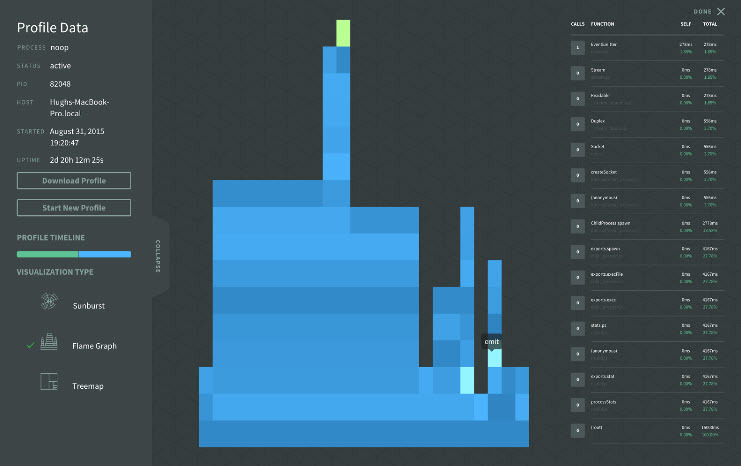 Resident Set Size: This chart shows the actual memory footprint of the process over time. It does not include memory that belongs to the process that has been swapped out to disk. Related Snapshots: This is a list of heap snapshots associated with this process. When you click [+ New Snapshot], you will be taken to the heap snapshot viewer and a new row representing the heap snapshot will be added to this list. Related Profiles: This is a list of profiles associated with this process. When you click [+ New Profile], you will be taken to the profile viewer and a new row representing the profile will be added to this list. This view shows information about the host system, including the hostname, how long the host system has been running, the name of the operating system platform, as well as information about the CPU including the manufacturer, model, clock speed and number of cores. At the very bottom is a graph that shows the total system-wide load over time. This screen is accessed by clicking on the 'More' link with the magnifying glass to the center right of the screen. If you’re looking for information regarding process and system statistics you’ve come to the right place. N|Solid gives you instant access to this valuable information both via our command line interface (CLI) and the console. 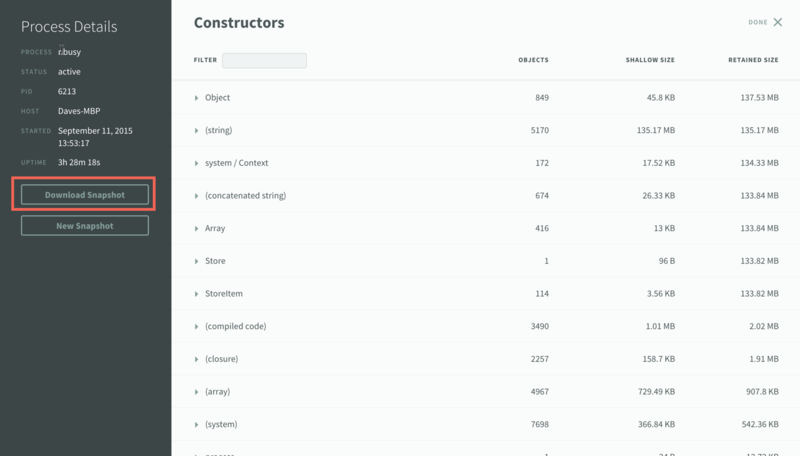 N|Solid provides useful command line tools for process and system statistics. Returns live metrics reflecting the health and resource utilization of the N|Solid process. active_requests The number of active requests the event loop will process. For more information see the async_activity command. active_handles The number of active handles the event loop will process. For more information, see the async_activity command. Returns live metrics reflecting the health and resource utilization of the system hosting the N|Solid process. Read more about memory load averages here. Returns static information about the hosting system for this N|Solid process. Critical information about the process and server is available within the console via a few simple clicks. Expand the details window and statistics detailed above via the command line interface are neatly displayed for viewing. Process and system information for this process can be seen in the next window. Additional information is available to the right by clicking the 'More' link with the magnifying glass. The --socket flag is necessary if you are connecting directly to the N|Solid Agent without using a N|Solid Hub; the common starting point of those evaluating N|Solid. If a full installation, we suggest you configure your nsolid-cli to use the N|Solid Hub. Async handles tend to be longer-lived larger-scale asynchronous operations, such as open sockets or timers. Async requests tend to be shorter-lived smaller-scale operations such as writing to file handles and other file-related operations. "api": "fs.read(fd, buffer, offset, length, position, callback)"
If you’re looking to see how long it takes to startup your application, check out our startup_times command. It will report to the nanosecond how long it took to bring core application elements such as Node.js and v8 online. You can also register your own custom life-cycle events by using process.recordStartupTime(). Lists the time from initial process execution to reach certain process lifecycle startup phases. initialized_node The time it took to initialize the Node internals. This indicates that node was initialized in 130,404 nanoseconds (which is 130 microseconds, 0.130 milliseconds, or 0.000130 seconds). The timing information is provided in hrtime format, which is a two element array of [seconds, nanoseconds]. A nanosecond is one billionth (1,000,000,000th) of a second. The time values are the elapsed time since the process was started." Learn how to implement a simple custom startup timer. As a developer, you can trigger your own custom commands via the N|Solid Command Line Interface (CLI). Custom commands allow you to interact with your application's processes in ways specific to your business needs. You can implement a custom command by creating a function to handle the command, and then registering the function with N|Solid. request.value An optional piece of data sent with the command, using the nsolid-cli parameter --data. request.return(value) The function to call when you are ready to return the result of this command. The Agent will reply with the value passed as a parameter. request.throw(error) A function to call if an error is encountered. The Agent will reply with the error passed as a parameter. Your function you must call either request.return() or request.throw() to signal completion of the command. Custom Commands can be "broadcast" via the hub if added to the .nsolid-proxyrc file's broadcast_approved list, as explained here. This program will run until you kill it. CPU profiling allows you to understand where opportunities exist to improve the speed and load capacity of your node process. N|Solid provides multiple ways to profile your CPU. The N|Solid Console allows you to take and analyze profiles in one action. This is particularly useful if you need to take a series of profiles as it saves you the overhead of switching from one environment to another. The console also saves a history of profiles so you can quickly flip through profiles to identify troublesome areas. 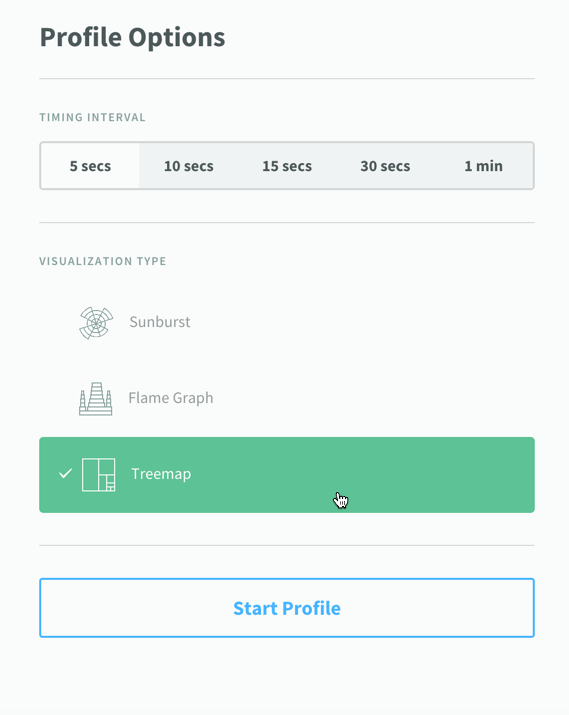 Select a visualization (Sunburst, Flamegraph or Treemap). Once a visualization is selected, you can click on it to view the call stack to the right. The number of calls to that method are shown as are the time spent within it. Clicking on the method will show you the file responsible for that call. Profiles are saved in your console session so you can easily flip between profiles. N|Solid's Command Line Interface (CLI) is a great way to quickly pull profiles from remote processes for local examination. With NSolid installed and on your path, a pair of commands are used to accomplish this. Collection will commence immediately after ‘profile_start’ hits the wire and will continue for up to 60 seconds. If profile_stop is not entered before 60 seconds then the process times out and the profile data is discarded. Order of execution is always profile_start, then profile_stop. Looking to do a timed test? You can do this with some simple scripting! 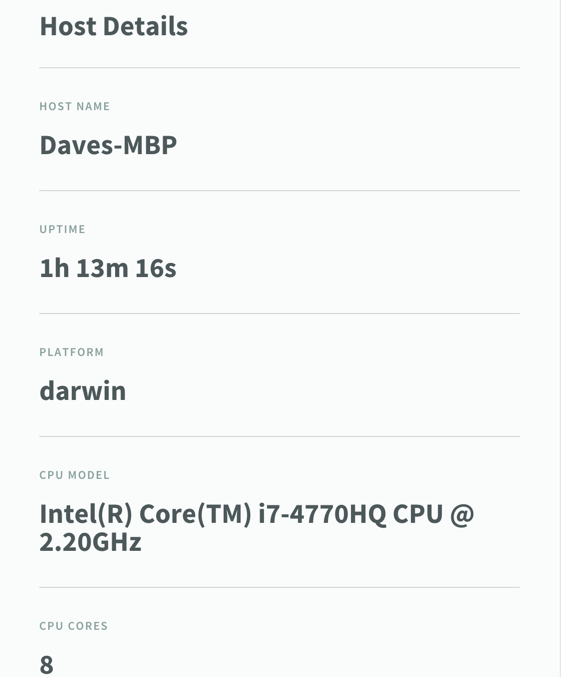 This will do a CPU profile while running a load test with ab (Apache Bench). If you wanted to do a timed one, replace the ab invocation with sleep 10 (to sleep for 10 seconds)." Once the .cpuprofile file has been created, it can be opened using Chrome’s Development Tool’s CPU Profile Debugging Tool. It’s important to note that Chrome requires the generated file to have the extension .cpuprofile so be sure to use that. Learn how profiling can help build a better product. Need Help Installing the Console? Read our Console Installation Guide. If you have a memory leak or performance issue, taking heap snapshots is a great way to help identify the underlying problem. N|Solid provides you with two ways to do this, a command-line friendly method and via our console. Using N|Solid's Console you can quickly identify troublesome processes and profile visually. The Console allows developers to take a series of snapshots and quickly switch between them to better identify problematic areas. This will take the snapshot and open the results in the snapshot window. To retake the snapshot, click the 'New Snapshot' button. The 'Related Snapshots' section in the previous screen provides a record of all the snapshots in the session. nsolid-cli -- socket XXXX snapshot > my.heapsnapshot"
Once the .heapsnapshot file has been created, it can be opened using Chrome’s Development Tool’s CPU Profile Debugging Tool It’s important to note that Chrome requires the generated file to have the extension .heapsnapshot so be sure to use that. Learn how prepping your code for snapshots can lead to more actionable results. In addition to the built-in life-cycle events, you can add your own using the function process.recordStartupTime(label) function. The label will then be used in the JSON output of the startup_times command. The timing information is provided in hrtime format, which is a two element array of [ seconds, nanoseconds]. A nanosecond is one billionth (1,000,000,000th) of a second. The time values are the elapsed time since the process was started. You can implement a custom command by creating a function to handle the command, and then registering the function with N|Solid. Detailed information about custom command usage can be reviewed here. Below is an example of how you can use custom commands to dynamically change the configuration state of the application; specifically the log level. The example assumes that a global boolean variable Verbose is used to indicate whether to log verbosely or not. // All these forms get or set the "verbose" level of logging in the program. // setting of "verbose" is false. The data returned from nsolid-cli is in JSON format, so it's easy to pull data from your N|Solid runtimes, and send it to an application monitoring aggregator. For instance, you could write a program to invoke nsolid-cli to collect performance data, and send it to a statsd aggregator. The N|Solid Agent comes with a set of pre-defined endpoints for interaction and introspection and can be customized to add additional endpoints. This is the agent's availability check, it will always reply with "PONG" if online. Returns the versions of bundled components that make up Node.js and N|Solid. If you're looking for information on how to add custom startup and lifecyle events check out this tutorial. The output will list the inflight asynchronous activity, including the function location and line of source code to reference where the callback will resume. Calling the async_activity endpoint will list two types of inflight async work -- handles and requests. Begins CPU Profile collection. It will collect for up to 60 seconds before timing out. If it times out, all profile data is discarded. Only one CPU collection is allowed to be running at a time. Must be run after profile_start -- completes the CPU Profile collection and sends the resulting cpuprofile data. In the N|Solid Console, this will be automatically loaded into our visualization system. From the CLI, the cpuprofile data can be saved to a file and then loaded into Chrome Dev Tools. The socket flag is necessary if you are running everything on one machine; the common starting point of those evaluating N|Solid. If you are connecting to a HUB, you would not use --socket. Improve the overall speed of your program. Typically, the V8 profiler isn’t available for access in Node distributions, but it’s built into N|Solid and can be controlled through the N|Solid agent. With the N|Solid runtime, you can direct the agent to start and stop profiling, and then return the results back as a JSON data structure. From the N|Solid Console, you can also request a profile and have the results displayed immediately in the console, with several different views available to display the profiling data. This following section is predicated on a .cpuprofile file already being generated. To do so you can generate it either from the CLI or Console. CPU profiling will indicate all the functions on the function call stack, when samples are taken. For instance, if a function foo() called a function bar() during its execution, and a sample was taken while bar() was running, the function call stack will show that foo() called bar(). Because multiple samples may be taken while bar() is executing, there will be an approximate start and stop time recorded for bar(), which is an indication of how long it took to run. In addition, further samples before and after the ones that captured bar() will capture foo(), and likewise to the bottom of the function call stack - typically, a callback of some sort. This data can then be analyzed to show, for the function foo(), how much time was actually spent in foo() and not in bar() - every function has two time values - a “self” time and a “total” time. For the foo() and bar() case, if foo() only calls the bar() function, then the “self” time for foo() + the “total” time for bar() will equal the “total” time for foo(). foo’s total time = foo’s self time + bar’s total time. Both values are interesting; total time shows you which functions are fastest and slowest, from start to finish, but doesn’t tell you if the time was spent in that function or other functions. All the visualization available for profile data show the unique set of stack traces captured during the profile, with the "area" of the stack indicating the proportional time spent in a function compared to that of it's parent. The Flame Graph visualization shows the time along the x axis. The y-axis is used to show show the function calls that make up a particular stack trace. The Sunburst visualization is like the Flame Graph, where the x-axis is curved into a circle. Stack traces grow from the center to the outer parts of the graph. The Treemap visualization shows time by area. The larger the rectangle, the more time a function took. The stack traces grow from the outer boxes into the inner boxes. Generally when using the profiling views, you're looking for long-running functions. This means you're looking for wide rectangles in the Frame Graph, long radial sections in the Sunburst, and large areas in the Treemap. The stack trace height - how many functions deep a particular stack trace was - doesn't indicate a time issue, necessarily. You'll want to focus on the time values. As you hover over the visualization itself, the method tied to the visualization will be show. If you click, you'll see a stack trace to the right of the visualization. Other areas in the visualization may "light up" with a less bright color as you hover over the visualization - these are entries in stack traces for the same function and indicates additional CPU usage for the function under the cursor. So, the things to look for are stack trace entries with that take up the most area: width in Flame Graph, circumference in Sunburst, and area in TreeMap. In a CPU profile, you'll see that busyFunction() is being called by(anonymous) in this case. In the CPU profile, you'll now see that busyFunction() is called by busyFunctionCaller(). What can analyzing heap snapshots reveal? Shallow size indicates the amount of space the object uses for its own properties. For instance, an object with no properties will have a very small shallow size, where an object with a number of properties will have a larger shallow size. Retained size indicates the amount of space the object is referencing, and keeping from being garbage collected. From the Constructors view of the Snapshot, you can sort by Constructor name, number of objects, shallow size and retained size. 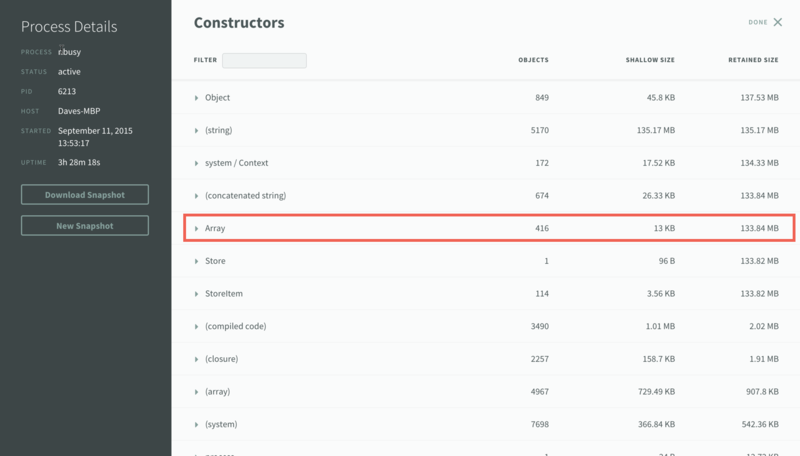 You can also filter the list by Constructor name. You can use the number of objects value to look for the objects that are leaking, and you can use the retained size value to look for objects referencing those leaking objects. In cases where you are leaking objects - and thus consuming more memory than you should be - sorting by number of objects and by retained size can provide a good indication of where to look for the cause of the leak. A large number of objects of a particular type may be an indication that these objects are still being referenced by other objects, when they could be garbage collected. A large retained size may be an indication that these objects are referencing more objects than they should be, keeping them from being garbage collected. Using constructors will show class names in heap snapshots Because the heap Snapshot groups objects by constructor name, if at all possible you should use named constructors for objects you'd like to track, as opposed to using literal objects. When using literal objects for trackable objects, those objects will be aggregated under the "Object" constructor name, along with all the other literal objects your program uses. You'll then see these objects grouped by themselves in the heap Snapshot. In order to control access to your application's N|Solid tooling, it is important that you use network tooling to limit exposure outside of your network. Following general network security best practices, you should consider all N|Solid components to be for internal use only, and not to be exposed to public networks. Use industry standard firewall tools to limit access to only trusted networks or hosts. The N|Solid Console needs to access the N|Solid Hub in order to operate, but does not need to directly access any of the N|Solid Agents. Specifically it must be able to access the N|Solid Hub Proxy, but does not need to access the Registry. We suggest using a VPN to use the N|Solid Console from remote networks. The N|Solid CLI tool has the same considerations as the N|Solid Console. The central position of the N|Solid Hub means it can be used to provide limited access to the running N|Solid Agents in your system. With appropriate access control configurations, only the N|Solid Proxy should need to communicate with your N|Solid Agents. This means that the N|Solid Proxy should be accessible by the network running the N|Solid Console, or anywhere you want to run the N|Solid CLI tool. The N|Solid Hub Proxy must be accessible by the N|Solid Console and N|Solid CLI tool. The N|Solid Hub Registry must be accessible by the N|Solid Agents in your network. The N|Solid Hub Proxy must be able to access your running N|Solid Agents. We suggest using the N|Solid Hub as a bridge between your corporate VPN and your production VPN N|Solid components. The N|Solid Agent needs to be directly accessibly by the N|Solid Hub Proxy and needs to be able to connect to the the N|Solid Hub Registry. It can optionally be directly used via the N|Solid CLI tool, though all direct operations can be also done via the N|Solid Hub. We suggest limiting exposure of your production N|Solid Agents to only the N|Solid Hub. N|Solid's policies feature should not be used as a blind replacement for good security practices with regard to your code and the code of your application's dependencies. Disabling core modules and bindings does not provide a complete guarantee that your application is unable to use the features provided by those parts of Node.js. For example, child processes interacting with Unix utilities, if not disabled, can be used to replace the functionality of many of the core modules. Some core modules may be completely re-implemented in user-land modules, such as the dns and cares_wrap functionality. Compiled add-ons have complete freedom to insert new functionality that can replace anything that has been disabled. N|Solid's policies features augment and support existing enterprise-wide application security hardening programs. Please contact NodeSource if you wish to discuss your Node.js application security needs and prepare a customized security hardening program that involves the use of internal and third-party code review, application monitoring and the use of operating system security tools.